Reheatza Microwave Crisper finally allows you to cook different food items just the same way you would with a grill or frying pan. This piece of cookware integrates a microwave-blocking lid into an energy-absorbing pan to generate conductive heat for heating up food. The lid is designed to shield food from damage by microwaves, while the base heats like a frying pan to deliver oven-like results. 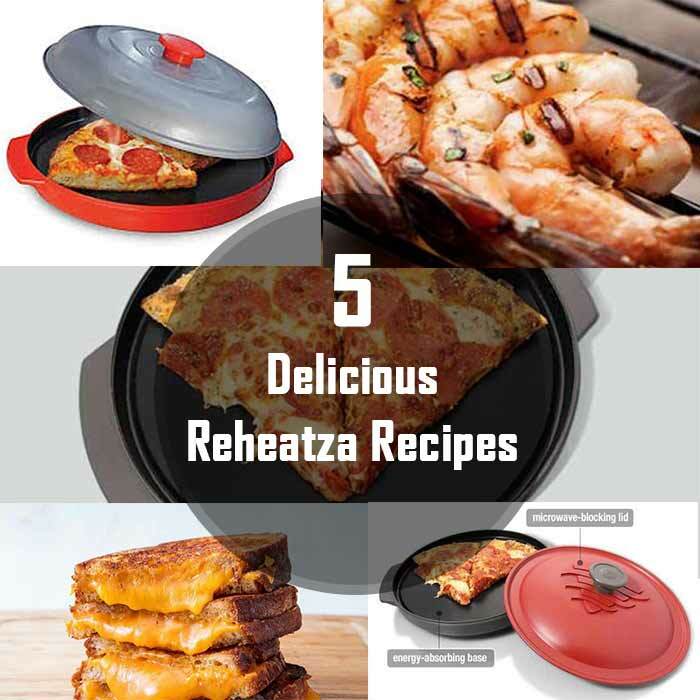 As a result, Reheatza provides oven-quality pizza, melted cheese, toasted sandwiches, frozen foods, grilled cheese sandwiches, hamburgers, chicken wings, and much more. Using this cookware is a cinch. Simply place food on the cooking surface, close with lid then pop in microwave. Reheatza’s lid blocks direct microwaves while bases heats food above, resulting in a crisp bottom and a top that retains moisture. We tried using this cookware to cook various Reheatza recipes and it delivered the desired end result. The following are a few Reheatza recipes you can try today. Note: These cooking instructions are aligned to a 1200W microwave. For a microwave whose power is less than or equal to 1100W, preheat for 3 minutes instead of 2. Pro Tip: You can grill further by allowing the grilled cheese to rest while on the heated Reheatza Microwave Crisper. If not fully cooked, cover the lid and cook for 30 second intervals. Pro Tip: You can cook pizza further for 30 minute intervals. If you wish to further melt the cheese, take out the lid and cook for additional 15 seconds. Pro Tip: If the scrambled eggs are not fully cooked, close the lid and microwave for 30 second intervals until properly cooked. Pro Tip: You can further cook the frozen pizza at 30 seconds intervals. If you need to further melt the cheese, take off the lid and cook for 15 seconds.